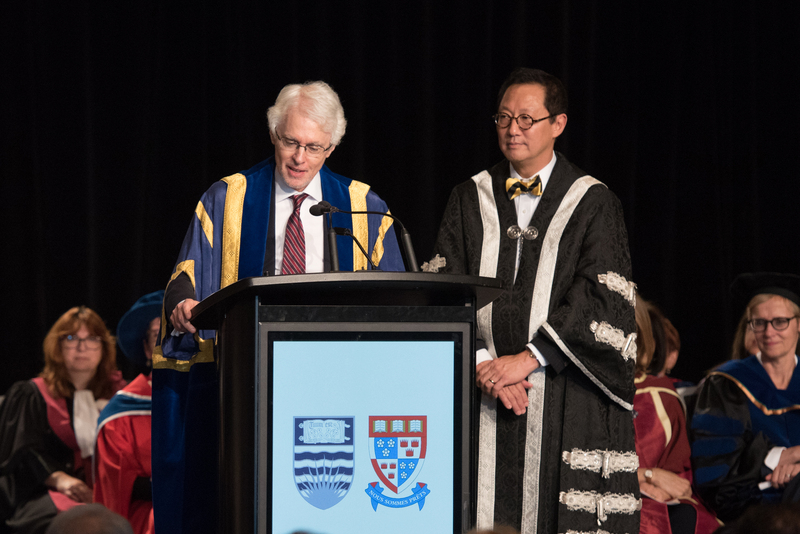 Professor Andrew Petter, President and Vice-Chancellor of Simon Fraser University delivers part of the citation in honour of His Highness the Aga Khan, as Professor Santa Ono, President and Vice-Chancellor of the University of British Columbia looks on. The two universities each conferred an Honorary Doctor of Laws on His Highness the Aga Khan in an unprecedented joint ceremony. As with UBC, Simon Fraser University is committed to the values of education, pluralism and global citizenship as drivers of social betterment. But SFU’s association with the example of His Highness the Aga Khan also relates to two other dimensions. First, SFU aspires to be Canada’s most community-engaged research university, for the benefit of our students and of the communities we serve. And I can think of no better demonstration of the value of community engagement than that exemplified by the Aga Khan Development Network. Second, we at SFU have committed ourselves to marshalling university resources to build social capital and to promote community betterment – goals that has been evident in the Aga Khan’s priorities for more than half a century. The advancement of education by the Aga Khan Development Network (or AKDN) is, perhaps, the most obvious illustration of this priority. The AKDN engages more than two million learners a year, including 750,000 in early childhood development and more than a million at the elementary and high school levels through the Aga Khan Schools and Aga Khan Academies. At the post-secondary level, the Aga Khan University and the University of Central Asia proudly claim 15,000 alumni, including doctors, nurses, teachers and school managers who are raising standards and playing leading roles in their fields and communities. In the area of health, the AKDN supports a network of hospitals, including the Aga Khan University Hospital in Nairobi, considered to be one of the best on the continent of Africa. The AKDN is also a leading supporter of health research, especially in areas such as tuberculosis that affect vulnerable populations. In support of civil society, the Aga Khan Rural Support Programmes have embodied and employed grassroots democracy, participatory governance and pluralism as the springboards for improving the conditions of more than 8 million people living in poor, rural areas. And the AKDN supplies agricultural aid to more than 100,000 cotton farmers, while its social programmes offer microfinance, education, health and sanitation support. In the category of humanitarian assistance, the AKDN is often one of the first on-the-ground responders after a natural or human-caused disaster, and one of the last to leave, working on long-term redevelopment for the benefit of all those affected. It frequently applies that same focus in remote and fragile geographies, working to reduce poverty, ensure food security and improve the livelihoods of smallholder farmers and their families. Also in the realm of social infrastructure, the Aga Khan Trust for Culture has shown how culture can be a catalyst for improving the quality of life. The Aga Khan Historic Cities Programme conducts complex restoration and conservation projects. It creates parks and gardens, and it plans and operates cultural assets from Afghanistan to Zanzibar. Indeed, His Highness earlier this week inaugurated the Aga Khan Garden in Edmonton, bringing to Canada some of the extraordinary cultural legacies of Muslim civilisations. In an area where culture, education and social infrastructure intersect, the Aga Khan supports the Aga Khan Award for Architecture. Since 1977, this has been one of the world’s pre-eminent architectural awards, focused on everything from village planning to environmental sanitation. In addition to a vast array of not-for-profit initiatives, the Aga Khan has also established the Aga Khan Fund for Economic Development, which invests in ethically run, self-sustaining companies that create employment, provide essential goods and services, and promote economic development. The Fund underwrites entrepreneurs and development, from an award-winning mobile phone company in Afghanistan to hydroelectric plants that provide half the electricity to Uganda – a country, by the way, that ejected its Ismaili population in 1972. This is a leader who has much to teach us about truth and reconciliation. And so we say, in looking to this remarkable record, and in celebrating the alignment of our values, it is clear that His Highness the Aga Khan is richly deserving of the honours we bestow today. We, in turn, are profoundly honoured to be in association with His Highness and the honours that we provide to our two institutions.